Can the Scientific Community Better Respond to 'Fake News' in Science? Can the Scientific Community Better Respond to ‘Fake News’ in Science? With all the hype around “fake news”, and the media trying to pretend like this is a new phenomenon and also creating the idea that we are in a “post-truth” era, some people in society recognize that we have always had fake news, and there are always people who aren’t interested in the truth of reality. One such person is Dominique Brossard, a Life Sciences Communication Professor at the University of Wisconsin-Madison. 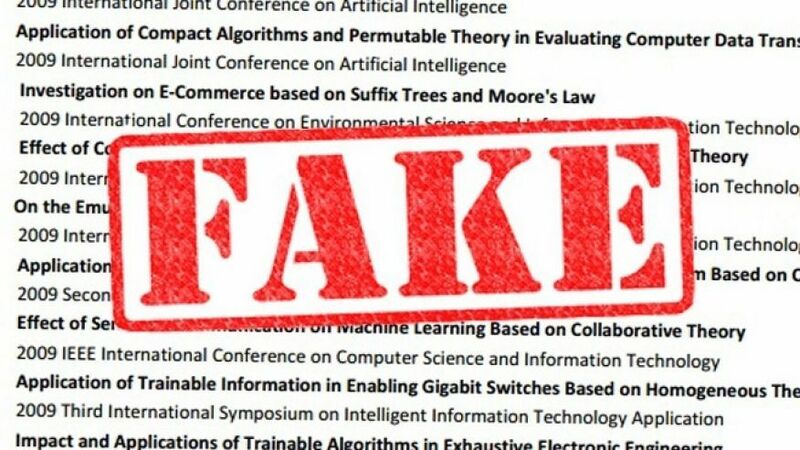 She discussed her finding on the fake news hype related to science and online social networks at the annual meeting of the American Association for the Advancement of Science. Fake news is spreading false information under the guise of real news. in order to influence people by them simply believing in it. Trashy tabloids are plenty, and even other magazines play on people’s uncertainty of not knowing if things are real or not. They sell gossip and sensationalism. Relating fake news and science, Brossard says there is a difference between bad science reporting, and then projecting that forward as fake news purporting to be real news. Some scientific studies might be poorly conducted, or merely poorly reported to convey a false understanding of the study. Does that make these reports fake news, or just poor reporting based on that study? A story that says “caffeine might cure cancer”, but it’s only based on a study of 20 people, needs to be evaluated better in order to determine if the conclusions are valid. The stories will often spread like wildfire in social media because of the hope and positivity they offer in our lives. Who wouldn’t be happy about the hope ingesting something can cure a loved one suffering from cancer? Journalism is often trying to get people to read their story, and will be more focused on how other people will be interested in the story and craft headlines that sensationalize or make extravagant claims to entice people to read more about it. Journalists aren’t trained to assess the validity of the study. Many are just trying to sell a story. Some stories might not be a fake story, but bad reporting can turn into conveying false information and thereby making it a fake news story. 1- Explaining more facts in the research at the onset can backfire with people double-down in their attachment to false beliefs. Explaining the context of how the data fits into reality accurately, by getting on some “common ground” understanding that the journalist can relate to, would provide a greater understanding as they can relate it to something they are already familiar with. Brossard says scientists need to be available to talk to journalists to explain things, or else they will go find someone else. Scientists have a level of responsibility to ensure their data is better represented to the public. 2- Agencies and institutions that deliver scientific research need to engage in quality or “brand” control. Coca-cola is used as an example, whereby they monitor when news agencies mention their name, and engages the social media conversations to launch damage control as required when false information is spread. The same can be done when studies are misrepresented, but there is no systemic way to facilitate this process yet. It would need to be developed. 3- Bad science that is retracted should be removed from search engines to prevent people from thinking it’s a valid study to use for coming to conclusions about something. Brossard cites Andrew Wakefield’s falsified vaccine study from 1998 as an example that persists. A good online tool for anyone to use is Retraction Watch, which usually has at least one retraction each day for poor or fraudulent scientific publications. Retraction Watch can’t catch everything, but the site currently reports between 500 and 600 retractions each year. Social media plays a large role in propagating false information. Social networks usually consist of people with like-minds who share a common body of knowledge, set of ideas or beliefs to unite and find common ground to form a community. Since changing people’s minds is hard to do once they have accepted a belief into their worldview, it’s important for scientific news to get things right from the start. We can all too easily work for a group or organization that is based around false information that we then become invested in, with our time, money and emotions. Brossard says there is no clear distinction between fake news and real news that can easily be discerned. In science news, scientists need to understand it’s not a “us versus them, the public” issue. Understanding the limitations in how the public comprehends scientific information can lead to better science communication where the scientists don’t shy away from collaborating in explaining their studies more in-depth and in easier to understand language. Many people are under the aura and appeal to authority that science and the ideology of “scientism” creates. If it comes from “science”, then automatically many people assume it to be “correct”. We all need to be more discerning of the information we input into our consciousness. Science is great, and scientists help us learn more about reality, but they aren’t infallible. Get out of the “cult of scientism” if you are in it and start thinking more critically for yourself.